The Minister for Justice has stressed that reforms will be put in place. 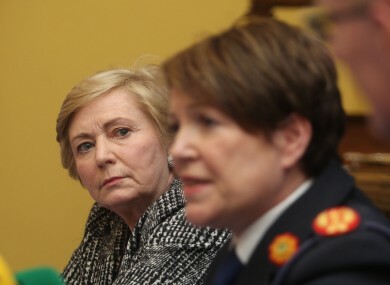 In an interview with the Law Society Gazette, Frances Fitzgerald stressed that the force wasn’t broken beyond repair. “No, it can be fixed. It can be reformed,” she said. She also warned against laying the blame on individuals within the force, and instead said the “poor systems” in place must be focused on. When I go down to Limerick and I see the horrific situations facing the gardaí down there with regard to murder – absolutely horrific to hear the details of what they have had to deal with; it’s beyond imagining actually – and you see how they’ve dealt with it, you see the commitment, the personal risks that gardaí take. She also described it as “quite incredible” that most gardaí are unarmed when facing these situations. The report, published last month, raised serious concerns about Garda processes and systems. It recommended an upgrade in technology, more effective systems to be put in place, and changes to management practice. Areas of concern included a delay in recording crimes on PULSE, or being incorrectly classified when they are, and how over two years 34,000 people who should have had their fingerprints taken did not. “This is an overdue analysis,” the Minister told the Law Society Gazette. This is a line in the sand and we move forward from here in terms of the reform agenda, which includes the new Policing Authority, which is the most radical change in terms of garda accountability in decades. Email “Is An Garda Síochana broken beyond repair? 'No, it can be fixed'”. Feedback on “Is An Garda Síochana broken beyond repair? 'No, it can be fixed'”.